Stuck for lunchbox ideas? Why not try this delicious, easy and child friendly Chickpea and Apricot Couscous Salad, which I created as part of the #FloraLunchbox Challenge. It’s quick to make and easily adapted to your own family’s preferences. Lunchboxes are tricky at the best of times, aren’t they? It’s hard to come up with good ideas each day that are easy, healthy and – crucially – that your children will actually eat! No-one wants that dreaded moment of opening the lunchbox up after school, only to find that it has hardly been touched – nor do they want the accompanying super grumpy child!! Yet, it’s all too easy to get stuck in a rut, or else just pick things we know our kids will eat, even though they aren’t the healthiest choices, isn’t it? And it turns out most of us are falling into the trap of making unhealthy choices for our children’s lunchboxes. A recent study conducted by the University of Leeds in partnership with Flora discovered that only 1.6% of lunches in the UK meet current nutritional guidelines. In other words over 98% of the lunchboxes they studied were unhealthy. I find this statistic shocking and very sad. But it gets worse: the study also found that only 17% of children’s lunches contained any kind of vegetables or salad; while 52% of lunchboxes contained confectionary, such as chocolate biscuits, cakes and sweets; 46% contained sugary drinks and 60% contained crisps. The trouble is, making a healthy balanced lunchbox is hard, especially early in the morning before the coffee has kicked in! 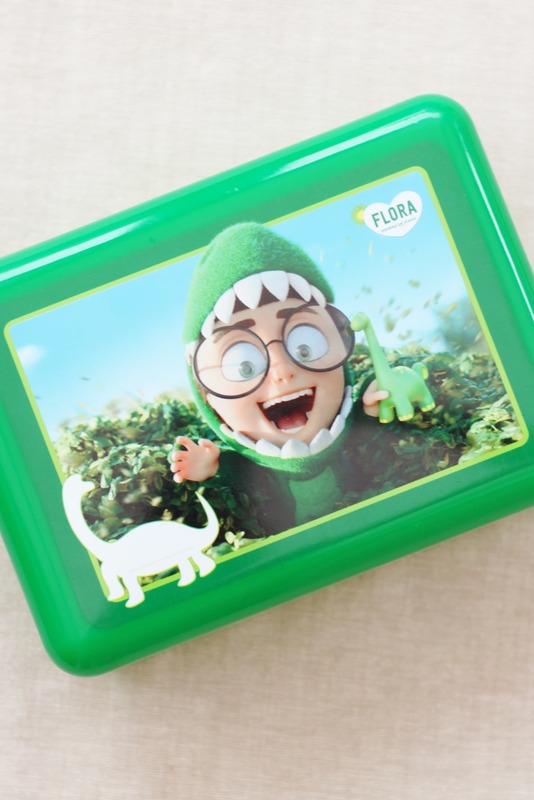 Fortunately Flora are keen to help and have developed a website full of hints and tips, as well as a lunch box packing guide to help busy parents create interesting and healthy lunchboxes for their children. Keen to share this information with as many parents as possible, Flora got in touch and asked if I would take a look at the website and share my experiences. Although my two mostly have school dinners, there are plenty of occasions when I need to make them a healthy packed lunch (or tea! ), such as school trips, after school clubs and weekend days out. I know that my packed lunches are reasonably healthy (they do at least always contain vegetables), but they are boring! I find myself falling into the same routine every time…a sandwich (often with white bread), some vegetable sticks, an apple and maybe a treat such as a packet of crisps or a dessert of some kind. Like the standard school report – I could do better! 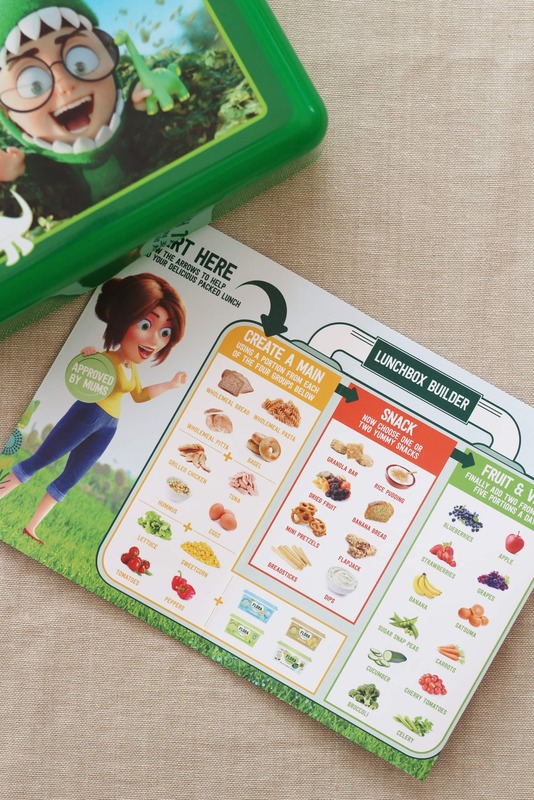 So I headed over to Flora’s website to get some inspiration…I found the website really helpful – especially the lunchbox builder – it enabled me to think about making my lunchbox as healthy as possible, but also gave lots of ideas about how to do that in practice. Armed with these ideas, I set about building a healthy lunch full of delicious and nutritious ingredients, that I know my two would enjoy. I have adapted one of the recipes on Flora’s website to include things my kids like and created this delicious Chickpea and Apricot Couscous salad. (You can find my recipe below). To make life easier you can make the salad the day before to have for dinner, either on its own or with grilled chicken, turkey or fish. The remainder can be chilled in the fridge and eaten cold in packed lunches the next day. 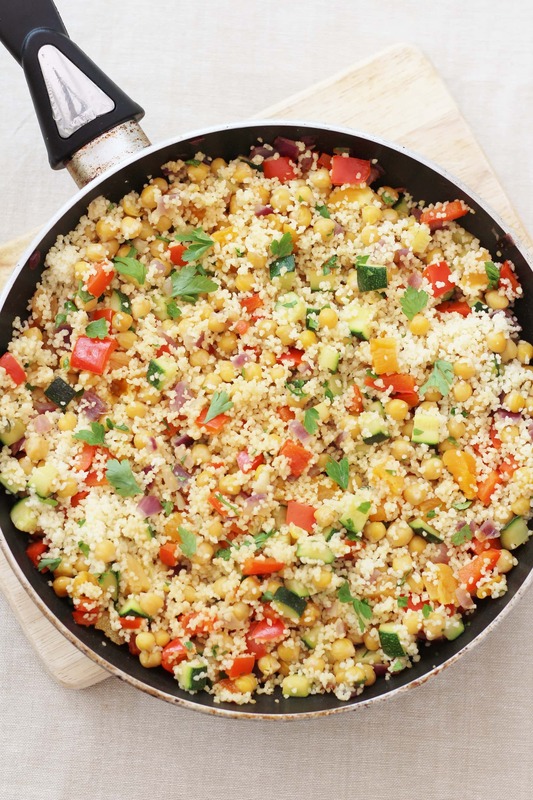 This couscous salad could easily be adapted for your own family’s preferences. 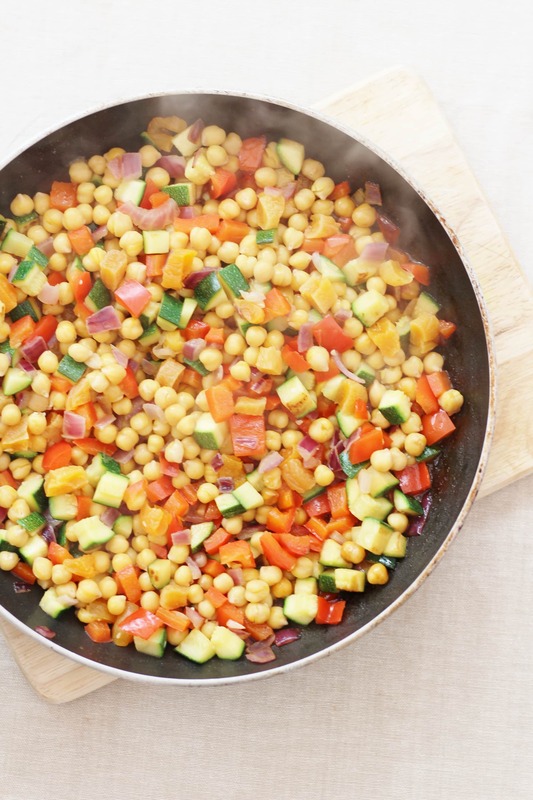 You could swap the chickpeas for tuna, chicken or turkey and use different vegetables, such as carrots, aubergine, tomatoes, mushrooms, sweetcorn or spinach. If your family is not keen on apricots try dates, raisins or sultanas instead, or just leave them out! You could swap the couscous for cooked pasta or rice and the parsley can be swapped for coriander or mint, or just left out if your kids are not fans of ‘yucky green bits’! This recipe makes enough for a family of 4 for dinner, with enough left over for everyone to have a healthy lunchbox the next day. But it’s very easy to scale up or down to suit your family’s needs. I’ve added harissa as an optional extra – for adventurous kids and/or grownups. Do leave it out if that’s not something your kids would enjoy! If you are making this for grownups too, you could take out the kids portion first and add harissa to the rest. The feta cheese, again, is optional – my kids absolutely hate it, so I left it out of their portion, but I love it, so I added it liberally to mine! 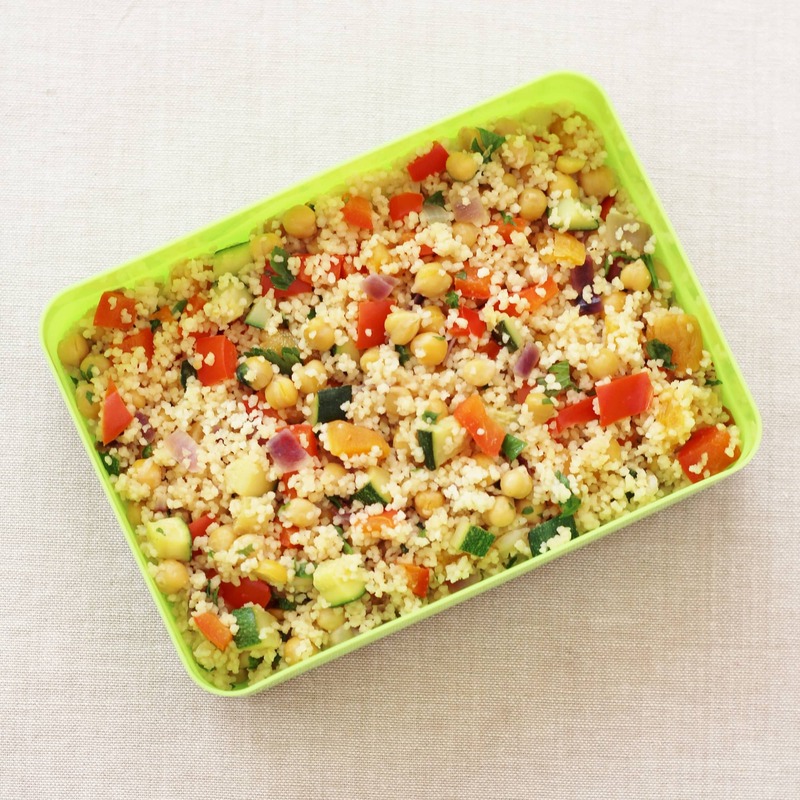 Stuck for lunchbox ideas? Why not try this delicious, easy and child friendly Chickpea and Apricot Couscous Salad, which I created as part of the #FloraLunchbox Challenge. It's quick to make and easily adapted to your own family's preferences. 2 tablespoons harissa optional, or to taste – be careful, some brands are rather fiery! Place the couscous in a large bowl and pour over the boiling water. Cover with a plate and leave to stand for 10 minutes. 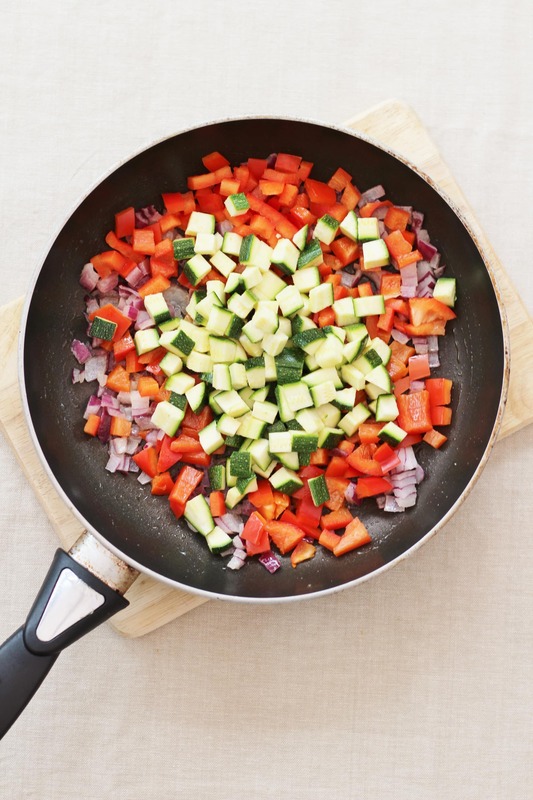 Meanwhile, melt the Flora in a frying pan and then add the onions, peppers and courgette. Fry for about 5 minutes until everything is nicely browned. Next add the chickpeas and apricots and stir everything together, then fry for 2 more minutes until the chickpeas and apricots are heated through. Next add the couscous and stir everything together. If you are making this for adventurous children / adults now is the time to add the harissa. Finally, Turn off the heat and add the parsley and lemon juice. 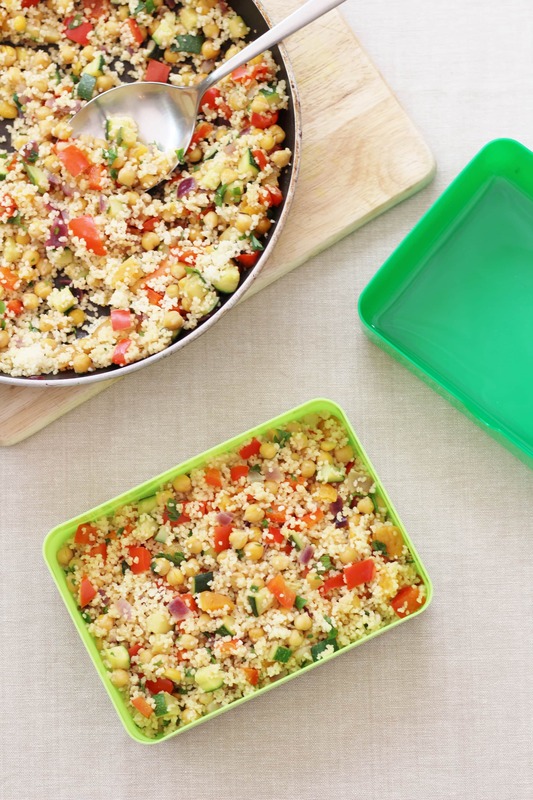 Scatter over some feta if this is something you and your kids enjoy and serve, or pack into plastic boxes and cool before putting this in the fridge until it is needed. This post is an entry for the #FloraLunchbox Linky Challenge, sponsored by Flora. Check out their lunch planner and recipe ideas here. Every Flora tub contains plant oils, such as sunflower, rapeseed and linseed oils. Flora is lower in saturated fats than butter and provides a source of healthy Omega 3 and 6. These essential fats contribute to the maintenance of normal blood cholesterol levels and are also needed for normal growth and to support the development of children. Flora also recently launched Flora Freedom. This is a 100% dairy free product, which is free of preservatives, artificial colours and flavours, and like the rest of the Flora range is approved by The Vegetarian Society. 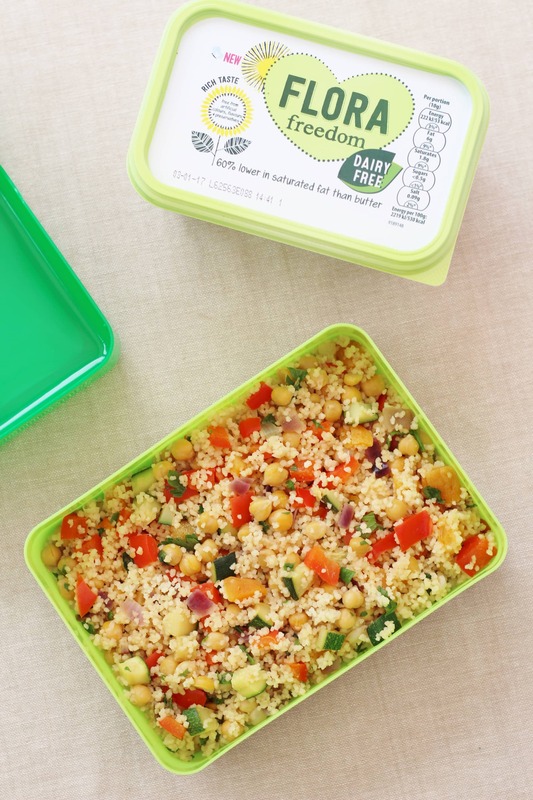 Have you got any good ideas for making healthy lunchboxes? If so please do share them in the comment below – I’m sure we could all benefit! Wow Eb, I’m shocked that Leeds Uni & Flora found only 1.6% of lunch boxes met national guidelines! I make Mr E a packed lunch every workday and I have to agree it’s oh so easy to fall into that rut of having the same sandwiches, fruit and drink. 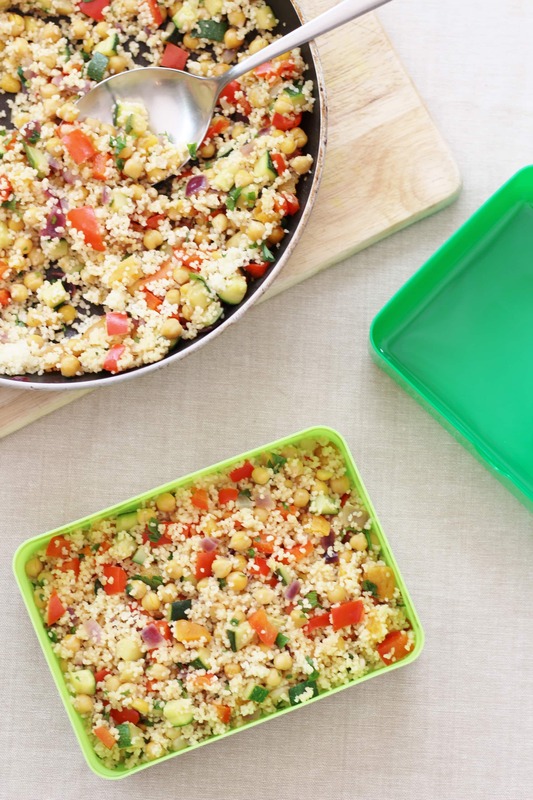 Love the idea of a couscous salad as a lunchbox meal Eb, it looks so delicious and packed with colours…..and of course feta..yum! Mmmm yummy pictures, I could eat them all! Our daughter doesn’t like couscous but it’s one of my favourite foods. There are plenty of options available on the Flora website that I’m going to try. Again, amazing pics! #FloraLunchbox challenge. That looks to tempting. Commenting for myself and on behalf of BritMums and thanking you for taking part. Wow, I am totally shocked by those lunchbox statistics – it’s not a good start for the kids, is it? The last school I worked at (I left in 2004) introduced a blanket ban on all confectionery, crisps, etc. not just in lunchboxes but also for playtime snacks. Most of the parents were really supportive but a few of them… my goodness, you’d have thought they’d been told that their children were to starve! One parent actually got herself banned from the school, due to storming into her child’s classroom to deliver sweets. And then she got banned from the perimeter because she tried to climb over the fence, and into the playground, in order to offload her contraband! She was a bit obsessed! Your salad looks really scrummy – although I’d sub a tahini dressing for the harissa because I am such a wuss! LOL!